We have come a long way over the last twelve months. Looking back at the debut of the World Magic Cup and Magic Players Championship, a revamped Pro Players Club, modifications to the Planeswalker Points invitation system, and a greatly expanded Grand Prix schedule, 2012 was definitely a year of change. This past year also saw efforts at improving our communication to the player base about Organized Play information. Those efforts continue today as we delve into what's in store for 2013. 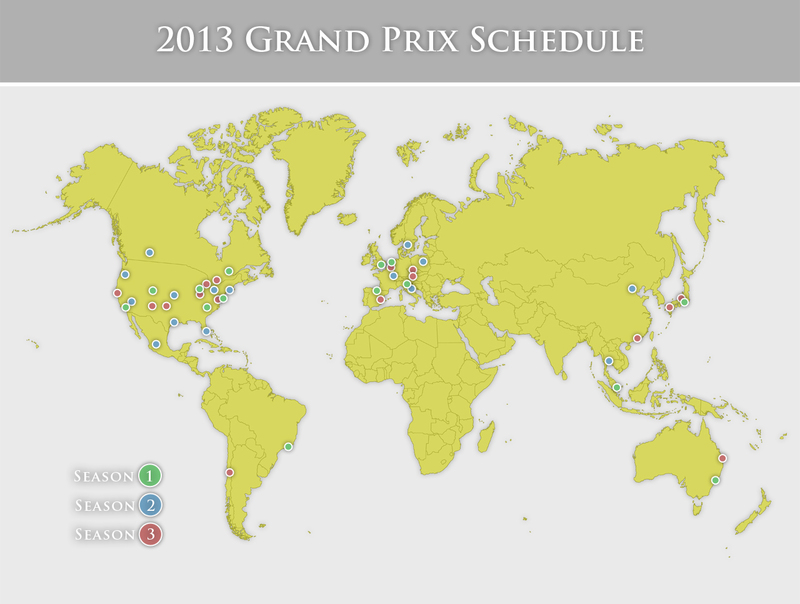 The Grand Prix schedule in 2013 has been completed, with forty-five Grand Prix to be played across the world. When we expanded the Grand Prix schedule significantly in 2012, our goal was to bring the GP experience to more players, and we're continuing that in 2013. We distribute Grand Prix according to the number of Magic players (i.e., players participating in tournaments) based in a given region. To date, 60% of the world's Magic players are in North America, 25% in Europe, 10% in Asia Pacific (including Japan), and 5% in Mexico/Central America/Latin America. The breakdown of the 2013 Grand Prix reflects these percentages, with a slight overrepresentation of Asia Pacific caused by the geographical challenges of this region. It is important to note that the ratios are derived from all Magic tournament play in a region, not by previous Grand Prix attendance in a given city or country. You can see the complete list of 2013 Grand Prix and formats at the end of this article. Expanding the schedule has brought unprecedented access to the Grand Prix experience, and players are making the most of it by turning out in record numbers. To adjust for this growth, starting with Grand Prix Indianapolis in December 2012, we will be extending Pro Tour invitations (and airfare) to the Top 8 players if a Grand Prix has 1,200 or more participants. Also starting in Indianapolis, the new Grand Prix promo card—Primeval Titan—will be available to all participating players (while supplies last). That promo card will be given away at Grand Prix through Houston in June. As we did in 2012, players will receive a different promo card for Grand Prix in the second half of the year. The World Magic Cup, to be held August 2–4 in Amsterdam, will be getting a slight tune-up next year. We heard from many World Magic Cup participants that they missed out on the Team Sealed Deck portion because it took place after the Day One cut. In 2013, we're streamlining the formats to accommodate that feedback. Day One will be three rounds of Magic 2014 Team Sealed and four rounds of Unified Team Standard, after which we will cut down to the Top 32 teams. Teams for the World Magic Cup will still be comprised of four team members—three World Magic Cup Qualifier winners and the National Champion (based on Pro Points). However, in 2013, there will no longer be a mandatory cut down to three players halfway through the event. Instead, each team will select three of its four members to play each format. Each team member must play at least one of the two formats during Days One and Two. Day Two will feature the four-team pod system that was used in 2012, which we felt added significant excitement. The first stage of Day Two will be Return to Ravnica Block Team Sealed, and after we cut down to sixteen teams, the second stage will be Unified Team Standard. The Top 8 teams will also play Unified Team Standard in Sunday's single-elimination playoff. 2012 World Magic Cup champions Chinese Taipei (left to right): Tung-Yi Cheng, Tzu-Ching Kuo, Yu Min Yang, and Paul Renie. Another take-away from the 2012 event was that multiple Constructed formats during Day Two led to player dissatisfaction. Because a given team wasn't even sure it was going to make it to that portion of the event, players weren't able to effectively prepare for a given format. For 2013, teams will be able to determine in advance which of their players can focus on building Standard decks for the team, and which players can focus on mastering the Team Sealed portions. The unified deck construction rule, which means a team cannot have more than four copies of a given card across its three decks, provides plenty of room for deck variation to make sure those rounds aren't a series of mirror matches. We learned a lot from running the World Magic Cup Qualifiers this year. Seventy-one countries ran WMCQs, adding an entry point into the top of the premier play structure to many countries that had previously been underserved. We expect to see a similar number of countries participating in 2013. World Magic Cup Qualifiers will begin in April and run through June. More information and schedules for the WMCQs will be coming early next year. We're also excited to announce that the prize pool for the World Magic Cup and all three Pro Tours has been raised to $250,000 per event. That's a cool million dollars to be handed out to the best Magic players in the world. Whereas the World Magic Cup was created to crown the top Magic country, the Magic Players Championship was created to award the Player of the Year title through direct competition rather than through an accumulation of results over a twelve-month span. The Player of the Year title has been the highest honor throughout Magic's history, reflecting the very best in the game. However, we also understand that another title has more impact to a wider audience—the title of World Champion. Therefore, in 2013, the Magic Players Championship will be renamed the World Championship, and the winner will be the Magic World Champion. The title of Player of the Year will return to being an award given to the player who finishes with the most Pro Points during the twelve-month Pro season. The World Championship will remain a sixteen-player tournament, with invitations going to virtually the same slots as this year. The event will feature four formats—two Constructed (Modern and Standard) and two Booster Draft (Modern Masters and Magic 2014)—with Modern as the format for the Top 4 playoff. It will be held in conjunction with the World Magic Cup in Amsterdam in a massive five-day Magic extravaganza starting July 31. Wednesday and Thursday will be the Swiss rounds of the World Championship, Friday and Saturday will be Day One and Day Two of the World Magic Cup, and Sunday will be the day of champions, with the World Championship final and the World Magic Cup finals. All five days will be streamed live, likely to create the biggest Magic-viewing audience in the history of the game! Pro Tour Qualifiers are also an important leg of our premier play offerings as they are the primary access to the Pro Tour. To better aid players in their preparation for the hunt for that Pro Tour invite, it is our goal to post complete information and a schedule of all qualifiers for a new season at least four weeks prior to the beginning of that season—a policy we will kick off with the Pro Tour Dragon's Maze Qualifiers that start on December 22. The immediate consequence of publishing the Pro Tour Dragon's Maze Qualifier schedule earlier than normal was that it triggered a significant amount of feedback regarding conflicts between individual PTQs in a given region, or between PTQs and Grand Prix. While it is our goal to minimize potential conflicts as much as possible, the increased number of Grand Prix (and, generally speaking, of Magic events) makes this increasingly difficult. Additionally, what is considered as a conflict by certain players is not always considered as one by another group of players. It is therefore important for us to manage players' expectations with regard to our ability to completely avoid conflicts. Improving the player experience is a top priority for us, and that commitment will continue in 2013. Starting with the qualifier round for Pro Tour Dragon's Maze, we are implementing two changes to the PTQ program. First, as mentioned in the PTQ season info page, participants in Top 8 playoffs will receive an exclusive playmat, available globally. Secondly, winners of Pro Tour Qualifiers will be awarded a bonus of 1,000 Seasonal Planeswalker Points. This award will be given to all winners of PTQs, including Magic Online PTQs. Because a player who wins a Pro Tour Qualifier can no longer play in PTQs, this was taking away a high-multiplier event type that could be used to secure Planeswalker Points for earning Grand Prix byes. Now, a player who wins a PTQ will automatically cross the 750-point threshold needed to earn a two-round bye at each Grand Prix that season and the following season—and will have the 1,500-point threshold well in sight through additional in-store play. Our thoughts behind this change are both to make up for the "feel-bad" associated with a PTQ win if that person is pursuing GP byes and to recognize the increased difficulty attached to winning a PTQ as the attendance for those events has been increasing significantly. As Magic continues to grow, we will continue monitoring how our programs are received to ensure the best possible distribution of our events globally. For more specific information about all of these programs, be sure to check out the updated Premier Event Invitation Policy. We also look forward to hearing more of your feedback on how to improve the quality of your experience at all Magic events in the coming year. I'm @HeleneBergeot on Twitter, and I'm excited to hear your responses to these changes and your ideas on making the premier play tournament scene as great as it can be.